No, I didn't leave my new writing job that quickly. 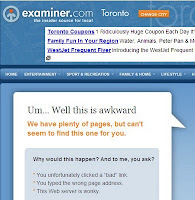 But Examiner.com just did a major redesign and it seems that all of my pages - along with those of many other newish Examiners - haven't been migrated to the new system yet. It's frustrating, since there are a lot of animal stories going on in the city right now, but the developers say they're working on it. I'm hoping everything will be back up and running by the time the weekend is over. Whenever the migration happens I'll also have a shiny new url to share with you. However in real animal news, Steve and I finally suited up our two indoor cats for their first on-leash adventure into the backyard. Unfortunately I don't have any pictures since I wanted to be able to focus on the task at hand, but I'm sure I'll get some during out future excursions - and we are planning on future excursions! "The Boys", shortly after we brought them home. We adopted Gizmo and Gadget as a bonded pair of older, overweight cats a few years ago. There was a lot of trial and error to find a diet that was both intended for weightloss and didn't upset up Gizmo's stomach, but we finally settled into a routine which has them both a couple of pounds down from their adoption weight. Still, they both need to lose more than just a couple pounds, so we're constantly trying to find activities that will get these old boys excited. We spent a lot of time debating the merits of controlled outdoor time versus the risks, and eventually decided it was worth giving it a try. We decided to take them one at a time, and Gadget went first. He didn't like all the time we spent adjusting his harness (they'd worn them inside a few times already, but I wanted to be sure we had a snug fit for the real thing), and he didn't look impressed as Steve scooped him up and carried him down the stairs. But once we were outside and his paws were on the grass, he seemed surprisingly at ease. There was a lot of slow exploration and a whole lot of sniffing, and only once did he get a little weird about the harness and the leash, very briefly trying to pull backwards out of it. We were a little worried when it was Gizmo's turn. The second I picked him up to take him outside he started howling the way he does when he goes in the car. We decided to just ignore it, but instead of putting him right on the lawn we settled down at the table with him on my lap. He stopped howling immediately and was soon sniffing the air and wanting to climb up onto the table. We let him survey things from there for awhile, then introduced him to the lawn. He was pretty quick to find a comfy spot to lounge, which is a little counterproductive, since part of the point of this whole exercise is, well, to get them some more exercise. Still, so far so good. If the weather's nice again tomorrow we may try them at the same time. And maybe I'll try for some pictures then!